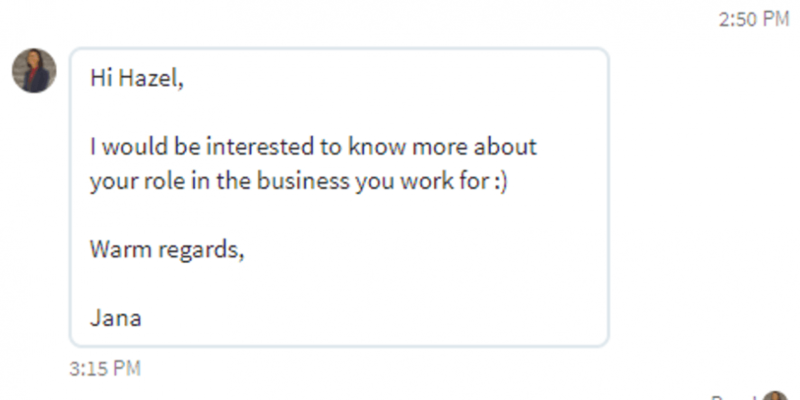 I had a connection request on Linkedin recently from a lady called Jana; she had very few connections in common with me and her profile didn’t seem to have an obvious connection to my business so I sent her a personalised message in response to her connection request asking who she was, the reason for the connection request and how I could help. In this final message from her I was able to quickly see that Jana had not looked at my profile at all as I am clearly the owner / founder and was unaware that I have my own business; therefore the role and the business I own are clearly stated. This isn’t information that is hidden away on my profile, but clear and obvious and in the top part of my profile too – all this message says to me is that Jana is about to sell to me and sell something to me that I am likely to have no interest in as she has not bothered to see who I am or what I do. If you are going to use Linkedin for business take the time to think about who you want to connect with, use the personalised message tool and take the time to look at their profile and see if they are who you want to approach, but include a message to explain why, ensuring you have made it clear you’ve looked at their profile.